Reader Question: I have always loved quilting, and I am thinking about trying to earn money through quilting. When I go into quilt shops, they tell me there is no money in quilting, and that it is very expensive to get started. To be honest, I just don’t know where to start. Quilting is a wonderful and very popular hobby. There are far more people that want to quilt, than there are people that want to buy quilts (at least at the price they need to be sold at). Because of the number of hours that go into making quilts, to make it profitable, they need to be sold for hundreds of dollars (or thousands for the larger and more time consuming ones). The majority of consumers are just not willing to purchase quilts for these amounts. They tend to equate a quilt with a fancy blanket, and go into sticker shock. Consider that a small quilt takes at least 20-30 hours for an experienced quilter to make, multiply that by say $10/hour, add in $50-100 in materials, and now you have $300-400 invested into it, and you still have to mark it up more than that in order to cover the general overhead costs of your business. There is more pricing information on our blog that goes into this in more depth. So…the real money in the quilting business is selling quilting supplies and services to other quilters, not selling quilts (the finished product) to consumers. The other major factor to consider is that many (if not most) quilt shop owners (that sell quilting supplies, quilting services, quilting lessons, and perhaps a few finished quilts) are finding it very difficult to stay in business, in today's economic climate. The overhead of paying rent for a storefront and all the associated costs of that (employees, utilities, etc) all add up very quickly. 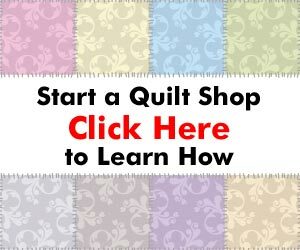 So the end result of all this is that the best way to make money in the quilting industry really is to do it online. The overhead costs are drastically reduced compared to opening up a physical shop, and your potential customer base is all across the country (and even worldwide to be honest). But this not to say that it is easy. You can't simply put up a website (or have one made for you) and expect customers to come knocking on your virtual door. Instead of the costs of opening a store, you have to put in time to grow a website by doing many of the things that would be outlined in Penny's course, for example. So this then leads to the fact that some level of computer knowledge needs to be learned, and if you don't have the computer and online marketing knowledge already, then this is where you need to start. The great thing is that this knowledge can be applied to any business, not just quilting, so they are skills that will do you well in the long run, even in other industries. This is definitely something you can do part-time while raising a family, etc, you just have to be realistic about your expectations. The more time you can dedicate to it, the faster you can grow it, but much more important than how many hours you put in is this -> putting in a bit of time every single day (well at least 5 days a week for a typical “work week”) ;). Spending 1-2 hours per day on what I call “Critical Focus Time” is what will make your business (or any other project for that matter) succeed. Maybe you only have 30 minutes per day you can devote to it, that's fine. Just make sure it's every single day. It's too easy to let life's daily activities get in the way, and it's this type of “procrastination” that kills most businesses from ever getting off the ground. You don't need a large sum of money up front to get into this business, it's more about finding time. The training through Penny is $497. You will need some money for a website hosting account (the place where your website lives), a website name, and things related to this, but these all tend to be small fees compared to things like a storefront rent. Website hosting can be found for under $10/month. A website name is about $10/year.